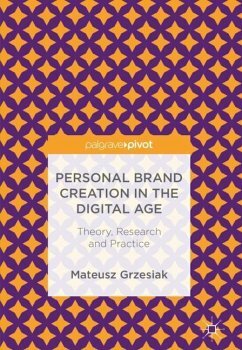 Presenting a scientific exploration of personal branding and digital communication, this ground-breaking book aims to fill a gap between theory and practice. Describing how social media can increase brand profiles online, it explains basic terms before investigating the cultural context for online personal branding. With a special focus on YouTube, the author provides a comparative analysis of two countries (USA and Poland) to open further avenues for research into this growing area. An essential read for management and marketing scholars, this study outlines and explores the evolution of media in the digital age from a business perspective, and offers a thought-provoking analysis for those interested in social media. Mateusz Grzesiak is an experienced and creative psychologist with an innovative approach to business consulting. He is the Chairman of the Starway Institute Program Council and owner and CEO of Starway Ltd., an international educational company. Keynote speaker at prestigious international events and conferences, and an academic lecturer with a PhD in Management, Mateusz is fluent in 7 languages. He is the author of various scientific publications and fourteen best-selling books on leadership, marketing, management and emotional intelligence. With sixteen years of experience in educational programs and seminar development, motivational speaking, business advisory and consulting, Mateusz is focused on effective and interdisciplinary educational solutions for individuals and organisations.